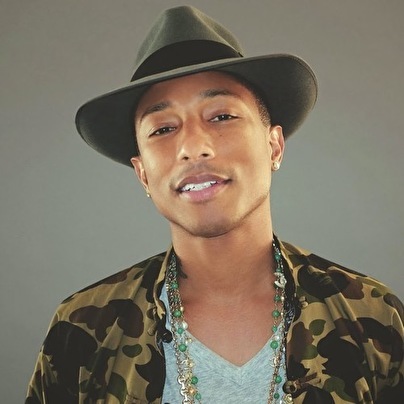 Grammy Award winning singer/songwriter/producer Pharrell Williams has made history for being one of the most successful and prolific artists to emerge during the last decade. As part of the beat-making duo The Neptunes with Chad Hugo and the alternative rock trio N.E.R.D. with Chad and childhood friend Shae Haley, Pharrell has helped A-List pop stars sell millions of albums and even earn Grammy Awards for the likes of Justin Timberlake, Nelly, and Usher. William's unique style and creative aesthetic has been a fore in several successful businesses outside the world of music. These include founding the popular clothing brands, Billionaire Boys Club and Ice Cream, as well as designing limited edition jewelry and accessories for Louis Vuitton. In collaboration with French furniture makers Domeau & Peres, Pharrell designed a collection of chairs called "Perspective" which debuted at the prestigious Emmanuel Perrotin Galerie in Paris. Pharrell followed up with a second chair design for the Emmanuel Perrotin Galerie called "Tank" which was released in 2009. He recently teamed up with Domeau & Pérès and Brooklyn Machine Works to create limited edition 'Velo' bikes. Williams also partnered with Tokyo born artist Takashi Murakami to create the artwork entitled "Simple Things" kicking off the official opening of Art Basel Switzerland in 2009. The sculpture was manufactured by Kaikai Kiki Co., Ltd in collaboration with Jacob & Co. It was started sometime early 2007, taking two years to come to complete fruition. Also a partner in Bionic Yarn, a 2 year old textile firm based in New York dedicated to developing environmentally sustainable fabrics using recycled plastic bottles. The company has corporate partnerships with companies including Cole Haan, End Star, Moncler, The Gap and Timberland. Lastly, he recently scored Illumination Entertainment's animated film Despicable Me featuring the voices of Steve Carell and Russell Brand. De Pharrell fans hebben er acht jaar op moeten wachten; een nieuw solo album van mister Williams himself. Waar de bezige baas al eerder met o.a. Robin Thicke en Daft Punk de hitlijsten domineerde bleef het solo werk lang uit. Tot nu, want op 'G I R L' krijgen we verse beats, gevatte lyrics én zijn megahit Happy. Succes gegarandeerd, toch?